I don’t believe in magic, at least in the traditional sense. The likes of ‘find the lady’, ‘sawing an assistant in half’ and ‘making an elephant disappear’, might all be impressive demonstrations of the skill of the illusionist, but I am of course aware that a successful magic trick is always based on misdirection, optical illusion or slight of hand. However, there is an exception. For me, some technology verges on real magic. Mobile phones, wireless internet and satellite navigation might in reality all be driven by clever physics, but they make my brain ache when I try and comprehend how they can even be possible. Magic is a much easier explanation. Light-gun games fall into this category too. Extreme unexplainable cleverness but in this case executed purely in the pursuit of fun. Although this is a review of a game from the 1990s, even then this type of game wasn’t new. Both the SNES and Sega Megadrive had their share of light-gun games and even the NES had Duck Hunt, so although impressive, this is old technology. 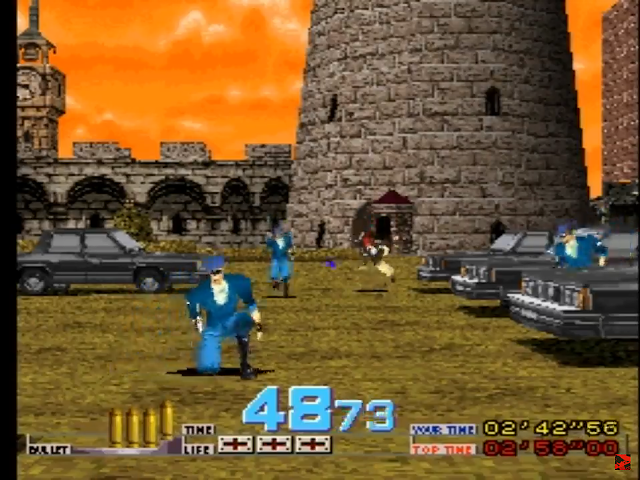 In fact I remember playing an arcade game called Wild Gunman as long ago as the late ‘70s, whereby the player would watch a preset video sequence of a cowboy and when his eyes flashed you had to draw and shoot. If you were fast and accurate enough you would be rewarded with a video of your assailant doubling up in agony and falling down the stairs or off a roof, you would register a kill and move on to the next opponent. But if you were too slow, he would blow the smoke from his gun, continue with his day and you would take the short and unwanted journey to boot hill. However, old tech or not, I always enjoyed this alternative method of gaming and the Time Crisis arcade game, although released by Namco in 1995 (more than twenty years later than Wild Gunman) kept to a strikingly similar formula. 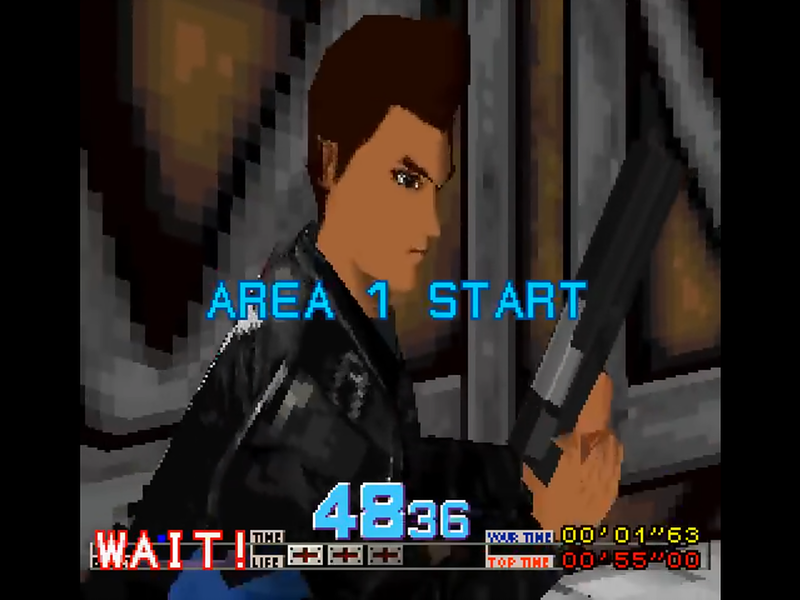 It was still you facing off against a series of bad guys, with just your gun, your memory and your razor-sharp reactions standing between you and certain death (or at least the dreaded ‘game over’ graphic, which at £1.00 a go in the 1990s was nearly as bad). 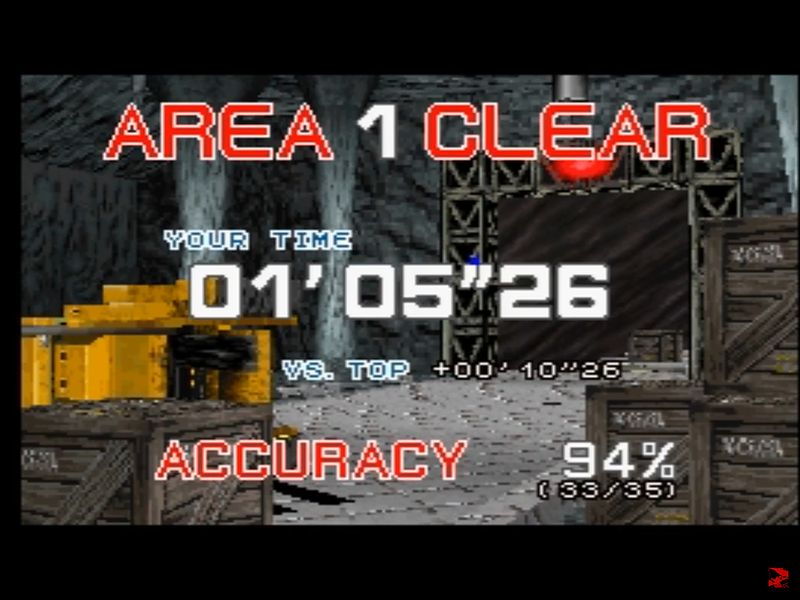 I played it a great deal in the arcades and although I never beat it I did manage to make it deep into the game. 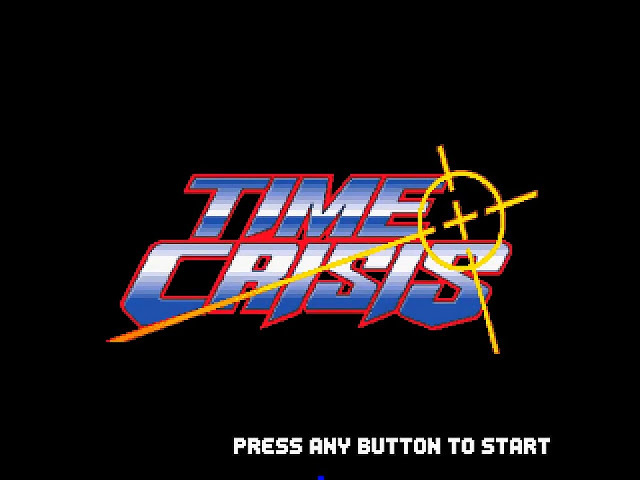 Time Crisis was ported and released for the PlayStation in 1997 and was the first game to make use of the new GunCon (later to be known G-Con) light-gun and paved the way for a whole new gaming experience for PlayStation owners, giving rise to a number of many other excellent shooting games including the Point Blank series, Resident Evil Survivor and Die Hard Trilogy. (Note - to play the game now, not only will you need a PS1 and the game (obviously) and a G-Con (or equivalent) but you will also require a cathode ray tube (CRT) television (that is a big, deep old fashioned one) because light-guns will not work on modern LCD or plasma televisions). You play as a ‘veteran’ (although graphically you appear to be about twenty!) agent, Richard Miller, who is tasked with rescuing Rachel Macpherson, the President’s daughter who has (surprise surprise) been kidnapped. There is a lot more plot than that but frankly I don’t care and neither will you, since it makes not one jot of difference to the gameplay. 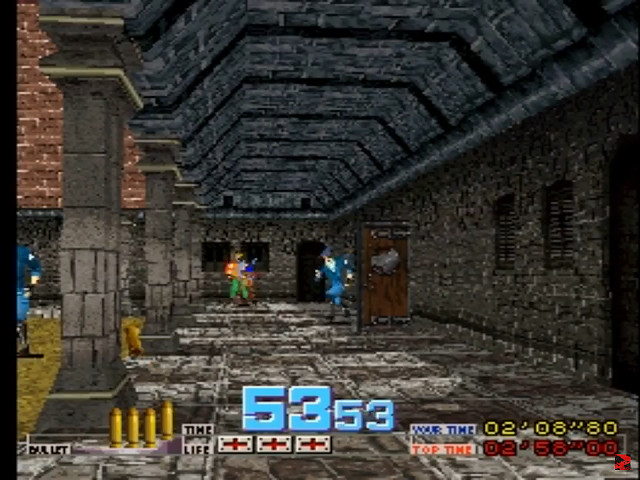 This is essentially an ‘on-rails’ shooter that sees you travelling through a series of three dimensional levels in the first person perspective, picking off the enemy one-by-one as you go. 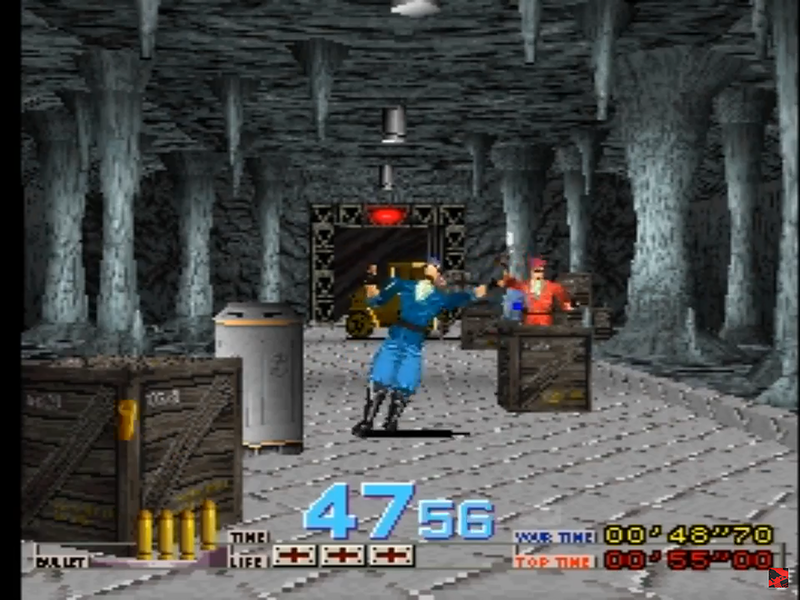 You have just two controls, using the gun to shoot or you can release the ‘A’ or ‘B’ button on the gun barrel to hide. Since the game is played against the clock and the available time has a habit of ticking down quite rapidly, the hiding, while an essential element to progression, needs to be used as sparingly as possible. Killing certain bad guys awards a time bonus as does finishing some sections of the game. You start with four lives and taking a direct hit results in the loss of one. Lose them all, or run out of time and it’s game-over. The various types of enemy exhibit different levels of accuracy so you quickly learn which to dispatch first (those dressed in red if you haven’t played before). 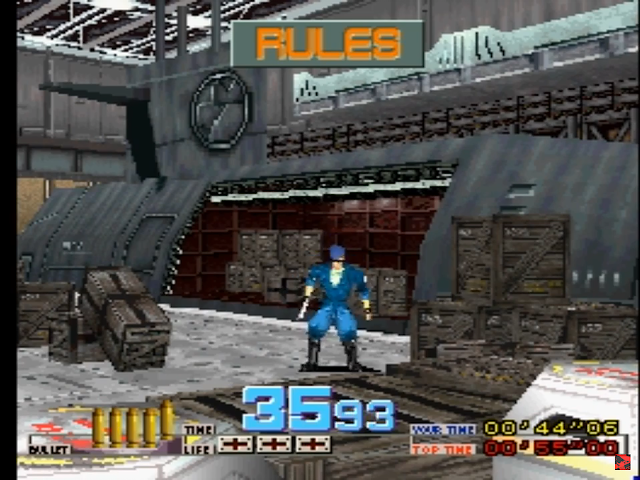 The port is a decent version of the arcade game, retaining the feel of the original exactly, the only discernable difference being that the arcade machine utilised a foot-pedal to make your character hide. The PlayStation version benefits from a ‘story’ mode; with your route through the game being determined by how quickly you clear a section or level. The graphics are solid but a bit blocky, and the sound does its job, with neither standing out. 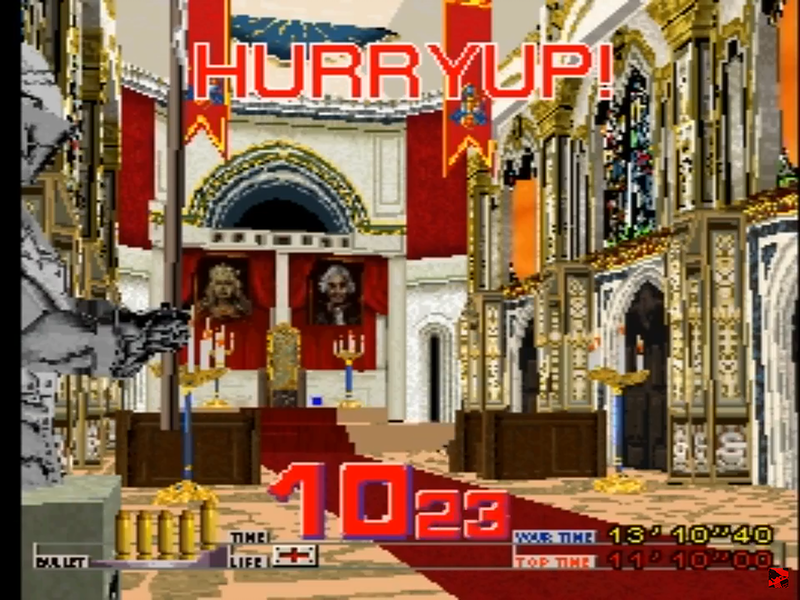 For the most part the background is exactly that, but there are occasional interactive parts, some requiring you to avoid things such as hanging crane hooks or cars being driven at you, and others where there are objects that will explode when shot, enabling you to kill multiple targets quickly, so there are some limited options to vary your play. The gameplay though, is magnificent. This is a really fun game to play and the satisfaction of dispatching a series of bad guys with single-shot perfection is palpable. There is no subtlety required; the nearest comparison I can offer is the film, ‘Taken’. If an enemy pops up (and they do, over and over again) you don’t stop and think, you just shoot them between the eyes and move on. 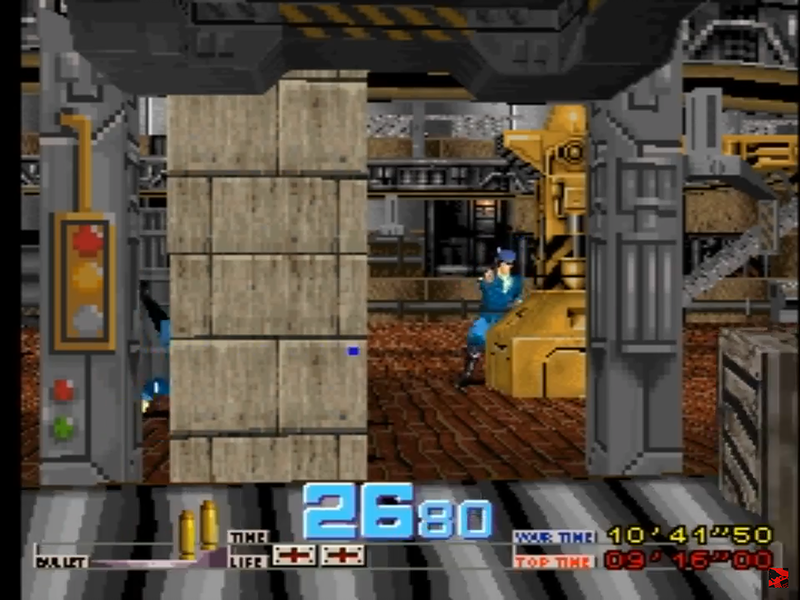 However (and this has to be listed as a negative in the interests of a fair review), as you replay the game, the enemies pop up in exactly the same place and at the same time, so the longer you play, the more it becomes a test of memory and less of a test of your reactions and skill as a shooter. While that can be said of a lot of games from that era, the ‘on rails, same every time’ feel of the game will inevitably provide a limited lifespan. You may well tire of it once you have mastered it, though there is always the challenge of replaying and trying to clear the various sections in record time.